The Pegasus is the only Art Deco Hotel Located in the heart of downtown Key West, Florida and walking distance from all Key West's famous attractions; Ernest Hemingway's house, Sloppy Joe's, Margaritaville, and much more. Free limited parking, swimming pool, Jacuzzi, sun deck Dining, Gift Shop, Cigar Store, the Pegasus International Hotel has all the conveniences of a full resort. See why they won the "Business for Beauty award"! Located at the Historic intersection of Duval and Southard Streets, the Pegasus Hotel features newly renovated rooms with various bedding combinations such as two double beds, queen and king sized beds. Each room has a private bath, color cable television, direct dial telephones with data ports for the business traveler, most with refrigerators and some with micro-fridges and daily maid service. Complimentary coffee is provided each morning. 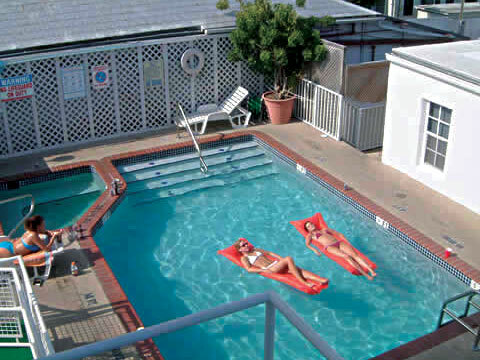 We have a heated pool and jacuzzi, both attached to a sundeck overlooking Duval Street uest Room Facilities (All Rooms are Suites): * Internet access * Cable television * View of Duval and Southard Streets * Phones in all rooms with data ports * Heated pool and jacuzzi * Sun deck * Private bath * Guest rooms are air-conditioned * Iron with full size ironing board in designated area * Same day laundry (available on request) * Refrigerators and microwave oven * Complimentary coffee * Limited free parking * Close proximity to golf course and tennis courts * Beaches (2-5 blocks) PEGASUS INTERNATIONAL HOTEL accepts guaranteed reservations by credit card only. Written authorization for 1st night's room plus tax per room for all special events is required. Our cancellation policy is 7 days prior to arrival for regular reservations. In addition to the above, the following also applies for Spring Break, Fantasy Fest and New Year's reservations: CASHIER'S CHECK FOR FIRST 2 NIGHTS AND CREDIT CARD FOR REMAINING NIGHTS. ALL DEPOSITS ARE NON-REFUNDABLE.